Common in granite pegmatites, granites, and rhyolites. Formed in some skarns and metasomatic manganese-rich rocks adjacent to igneous intrusions or in regionally metasomatised areas (Anthony et al., 2001—2005). Original description: Beudant, F. S., 1832. Spessartine — Traité Élémentaire de Minéralogie, Paris: 52—55 [view in ‘Library’]. Type locality: Sommer quarry, Wendelberg, Haibach, Aschaffenburg, Spessart, Bavaria, Germany. Etymology: renamed after its type locality in the Spessart Mountains, Germany. 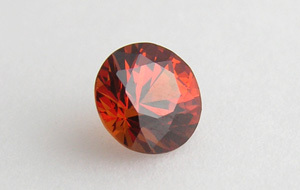 Distribution: while a less-common garnet, nevertheless many localities: Brazil: Minas Gerais; Germany: Bavaria, Spessart, Aschaffenburg; Madagascar: Anjanabonoina; Namibia; Pakistan: Gilgit; USA (Anthony et al., 2001—2005). Essential elements: oxygen (O), aluminium (Al), silicon (Si), manganese (Mn). Crystallography: isometric — hexoctahedral. Crystal habit: commonly as euhedral crystals, dodecahedra or trapezohedra, or in combination with other cubic forms, to 10 cm; fine or coarse granular, compact, massive (Anthony et al., 2001—2005). Cleavage: none. Fracture: uneven to conchoidal (Anthony et al., 2001—2005). Tenacity: brittle (Anthony et al., 2001—2005). Hardness: 7—7.5 (Lazzarelli, 2012). Density: 4.12—4.18 g/cm3 (Lazzarelli, 2012). Luminescence: none (Arem, 1987: 106). Colour: red, reddish orange, yellow, yellowish brown, reddish brown, brown, black; pale pink to pale brown in thin section; may be sectored (Anthony et al., 2001—2005). Diaphaneity: transparent to translucent (Anthony et al., 2001—2005). Lustre: vitreous (Anthony et al., 2001—2005). Refractive index: 1.789—1.82 — isotropic (Lazzarelli, 2012). Dispersion: 0.027. Pleochroism: none. 7 specimens: 0156 — 3.65 ct, Nigeria; 0049 — 1.86 ct, Namibia; 0098 — 0.38 ct, no precise locality [East Africa]; 0450 — 0.69 ct, Namibia; 0652 — 0.64 ct, Namibia; 0633 — 0.25 ct, Namibia; 0441 — 0.24 ct, no precise locality [East Africa].